The Pan American Health Organisation’s (PAHO) Regional Advisor, Dr. Dana van Alphen and Procurement Specialist, Ibargues Santiago are featured as they met with Minister for Health and Social Development, Honourable Ronnie Skelton and Permanent Secretary in that ministry, Petrona Davies on October 30. 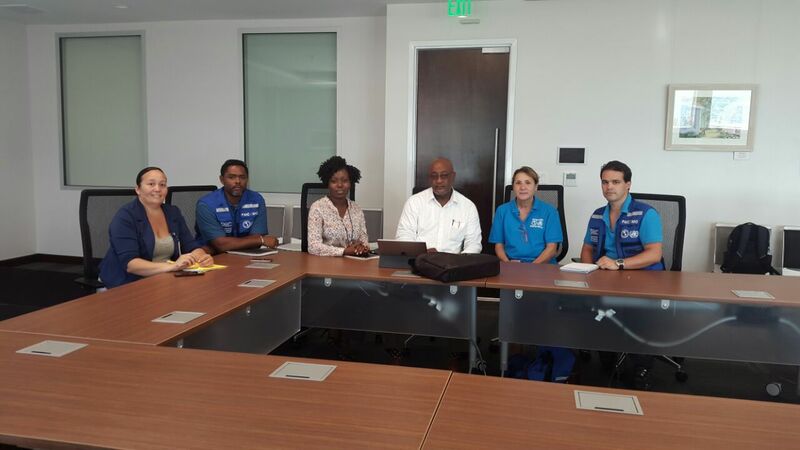 The PAHO officials are in the BVI to discuss the agency’s assistance to the Territory in the wake of Hurricanes Irma and Maria. Also present at today’s meeting were Director of National Emergency Operations Centre, Sharlene DaBreo and Principal Consultant, PAHO’s SMART Hospital Project, Ronnie Lettsome. PAHO has committed US $1 million to support the health response following the passage of the two category 5 hurricanes. The money will be used to purchase vehicles for the Environmental Health Unit, medical consumables specifically for hospitals, clinics and elderly homes, and pharmaceuticals. The PAHO funds will also be used to conduct repairs to Adina Donovan Home for the Elderly, the Virgin Gorda Elderly Home and clinics that experienced minor damage.